Create your own high-caliber games with some of the same tools used by professional game developers! 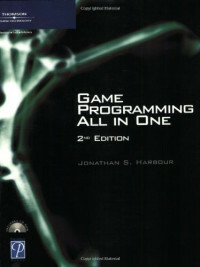 If you have a working knowledge of C or C++, then "Game Programming All in One, 2nd Edition" can get you started on your journey. It uses hands-on projects to explain each new subject and includes many sample programs to reinforce the material in each chapter. Begin by learning about cross-platform game programming, writing code that will run under Windows, Linux, Mac OS X, and many other systems. Enhance your skills by working through the core features of the Allegro game library and writing code to load images, manipulate sprites, scroll the background, use double-buffering, read a joystick, detect collisions, and implement other core features of any game. You will gain experience by creating a complete game and adding features to it in each new chapter. You will also learn how to write a scrolling platform game and a vertical shooter.